In a pan, heat the butter over a medium–high heat. Add the onions and garlic. Cook, stirring, until they just start to colour – this should take about 4 minutes – do not let the butter burn. Lower the heat to medium, add the ground turmeric, salt, ground pepper and sugar and cook for a further 4 minutes. Take the pan off the heat and leave to cool. Transfer the onion mixture to a food processor, add the chopped coriander and chillies, then blend to a paste. 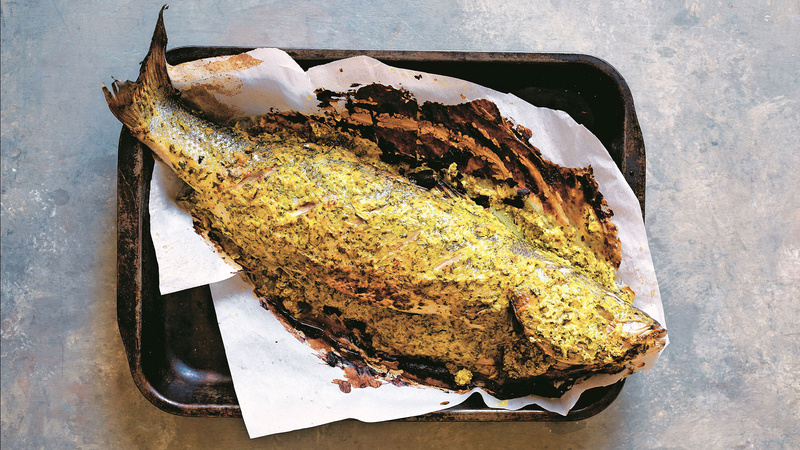 When ready to bake the fish, preheat the oven to 180°C. Place a sheet of parchment paper on top of a sheet of foil. Wrap the fish in the paper and foil, then place in a roasting tray. Bake in the preheated oven for 45-60 minutes, depending on the type and size of fish. From Asma's Indian Kitchen by Asma Khan; photography by Kim Lightbody. Published by Pavilion Books.